Here we are at the end of May and I’m happy to share with you the final phase of my front garden re-do! 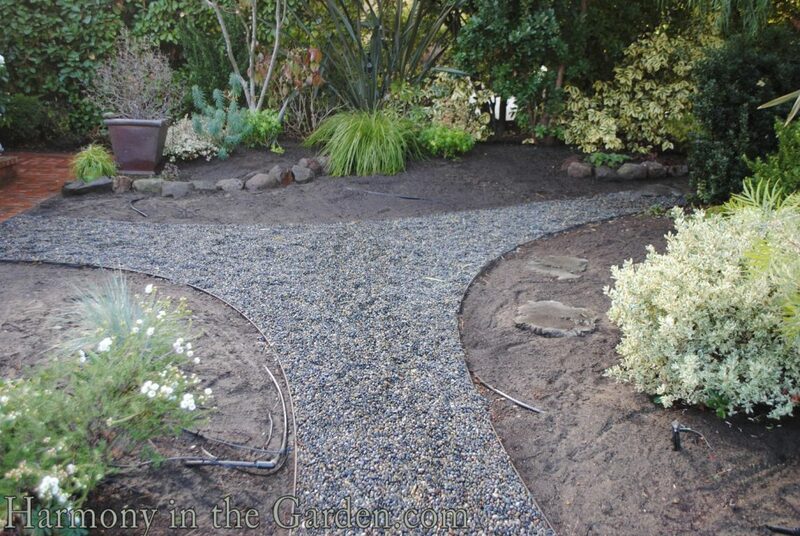 As you may recall, in January I finally decided to remove my little-used front lawn and replace it with a low-water garden (you can read about it here and here). Hefty amounts of chartreuse and yellow are used throughout my garden to help create a bright yet lush atmosphere. 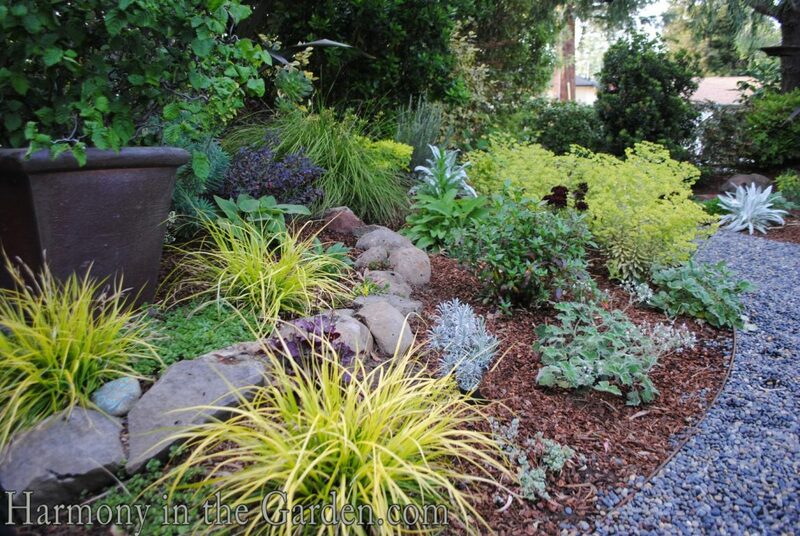 So often, low-water gardens consist primarily of the color gray which, while beautiful, when overused can end up looking a little hot and parched. To counter-balance this effect I interspersed plants with chartreuse, gold and yellow highlights, among those nearby plants that are dark green and maroon. 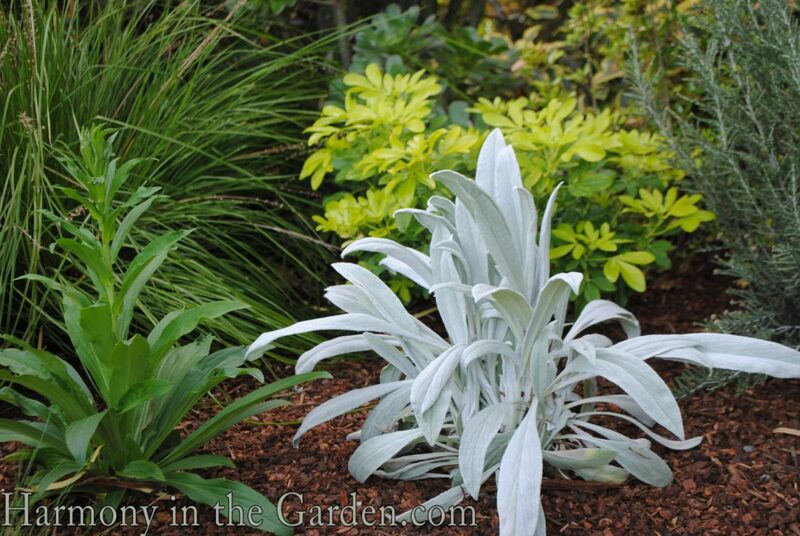 I didn’t eliminate gray, but chose various shades from the brightest white, to soft gray-green, carefully placing them throughout the garden to create a ‘woven tapestry’ effect. I’m looking forward to seeing it once everything’s grown to its full size! Some of my favorites are the euphorbia ‘Ascot Rainbow’ , chartreuse carex ‘Everillo’, gold-splashed euonymus ‘Moonshadow’, the yellow flowers of phlomis ruselliana (Jerusalem sage) and the new darling of my garden – a plant that I started from a small cutting from my brother’s former garden – a helichrysum italicum (Curry Plant, below). I just love the pale cream flower ‘balls’ in the early spring and how once burst open, add such textural interest with both open and closed buds on the same cluster. So far it has provided me with several months of happiness. 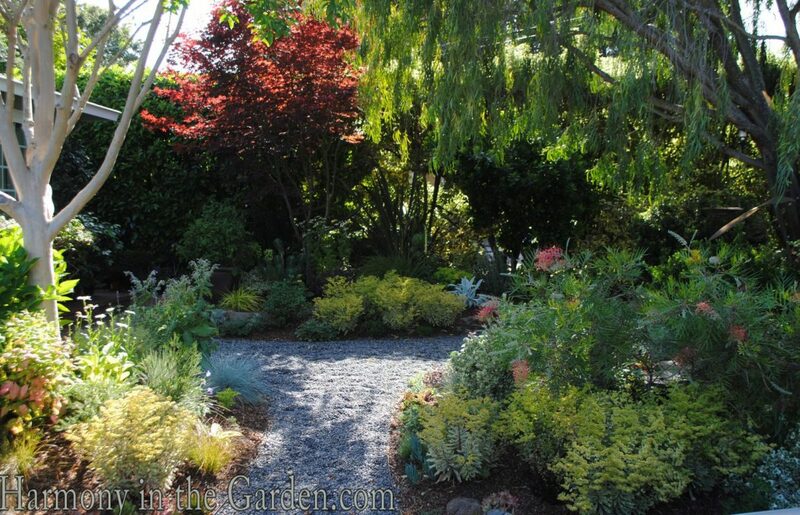 Burgundy is another color that I can’t do without, adding rich shadows to an otherwise green garden. I have two established Japanese maples that thrive on very little water – the smaller ‘Shaina’ and larger, upright ‘Bloodgood’. I like how they help to emphasize the chocolate brown color of the container placed in the garden bed. 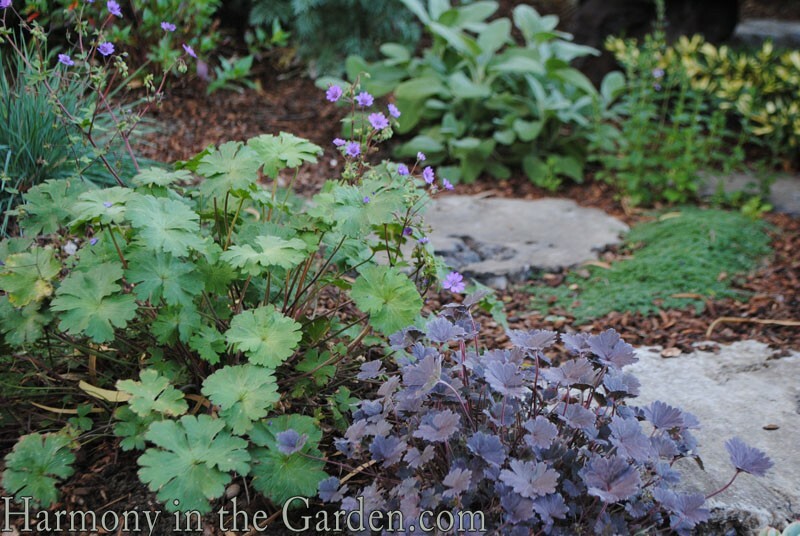 The dusky plum foliage of ‘Cheryl’s Shadow’ geranium (below) helps to highlight the purple flowers of neighboring ‘Bill Wallis’ geranium. 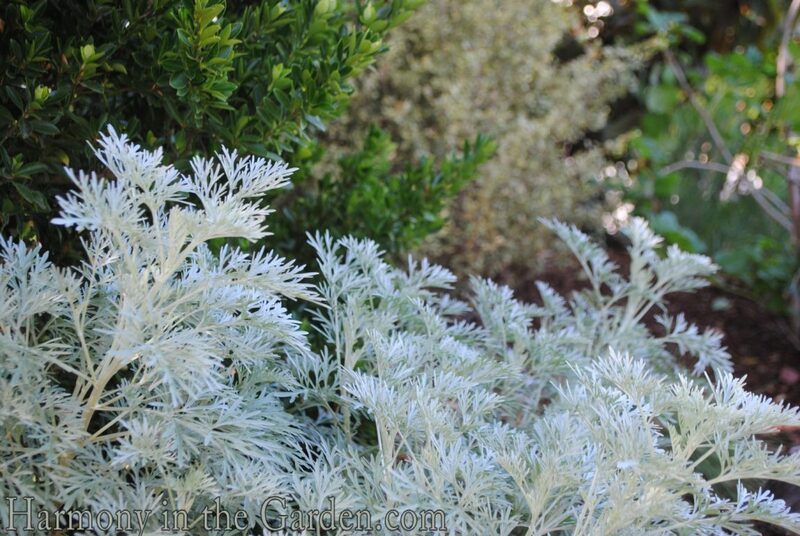 The bright silver, velvety foliage of the stachys ‘Bello Grigio’ contrasts nicely with the rigid, delicate, needle-like foliage of the Australian Pillflower bush (ozothamnus ‘Sussex Silver) placed nearby. Even the edible flowers and hairy stems of the borage adds a wonderful texture to the garden – especially when backlit by the morning sun. To help emphasize the striking color and upright form of the ‘Bronze Baby’ phormium I surrounded it with lower, mounding plants such as the ‘Bergartten’ sage and California native solanum xanti ‘Mountain Pride’. I hope you’ve enjoyed seeing the progress of my front garden. I look forward to comparing the water bills once we’re in the middle of summer – I’ll keep you posted! I’ve been invited to speak at this year’s Sunset Celebration (80 Willow Road, Menlo Park, CA) held this weekend May 31st and June 1st. I’ll be speaking each day at 3:00 on the topic of Designing with Drought, and will cover the above concepts in depth (and much more) using plants to perform my version of ‘before and after’. It’ll be tons of fun, and if you’ve never attended I highly encourage you to come on out! If you’d to know more about the event, click here. Now for the giveaway! 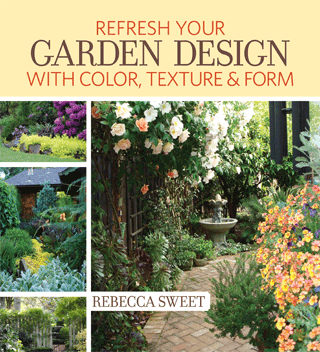 In honor of the completion of my front garden I’m offering my new book, Refresh Your Garden Design, to one lucky winner. To enter, just leave a comment as to your favorite low-water plant. It’s that simple! The giveaway begins Thursday, May 29th and runs through midnight Thursday, June 5th – the winner will be announced on Friday the 6th. Please note that due to shipping costs, this giveaway is restricted to residents of the continental U.S. So leave a comment and check back next Friday to see if you won – best of luck everyone! Your garden is lovely. We are working on removing a ton of lawn from our new to us yard. I can’t wait to plant some penstemon, they’re gorgeous and good for the bees. 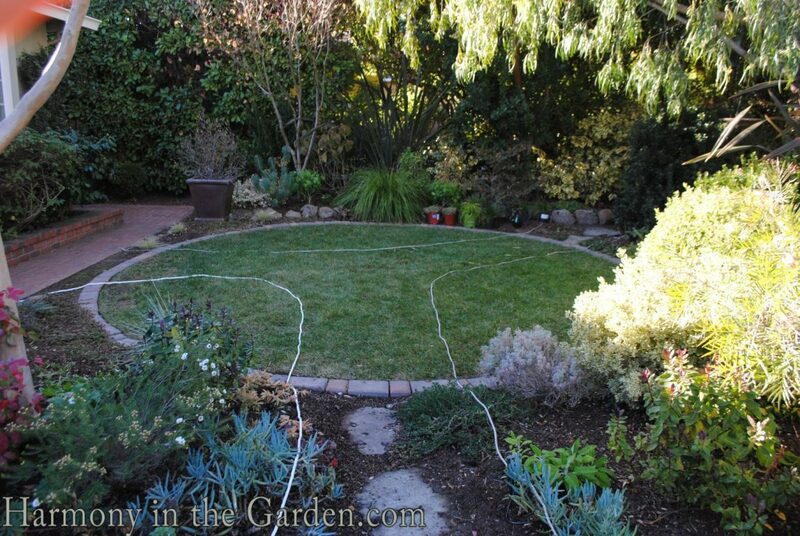 WOW Rebecca – your garden looks beautiful! I love every part of it. My favorite low water plant are succulents! First, I just have to say that your work is consistently a feast for the eyes. Love it. Second, I’m pretty hooked on Gaillardia. It is one of the few plants that seems terribly unconcerned about water and still looks beautiful. 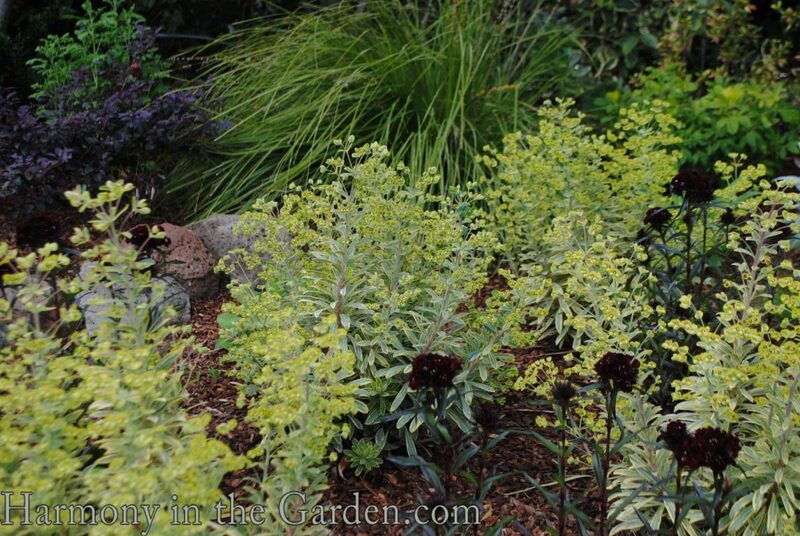 Hardy sedum. I love the kind of dusky green color, and it hold up whether I water it or not! I love all types of sedum which hold up well in the heat. Thanks for this fun opportunity! My favorite low water plant is yellow butterfly vine (Gallinita). 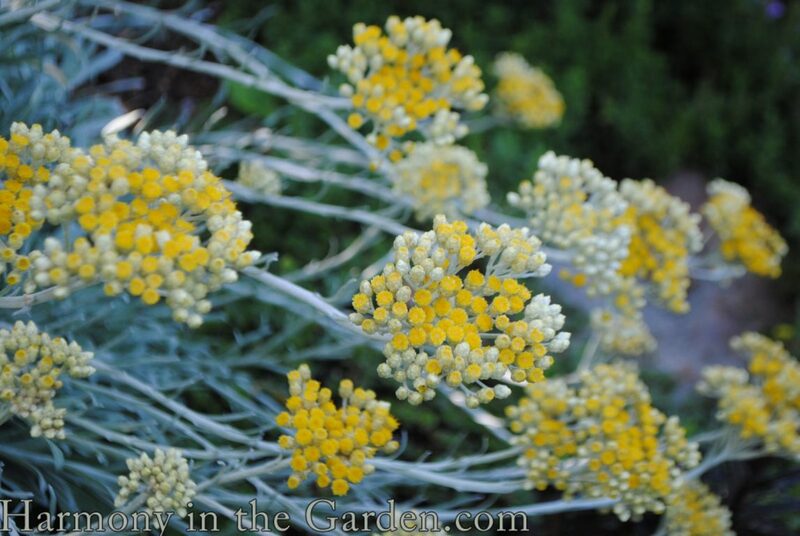 Has yellow blooms all summer and great seed pods that look like fluttering butterflies and it takes the l00+ degree weather with little to no supplemental watering once established. 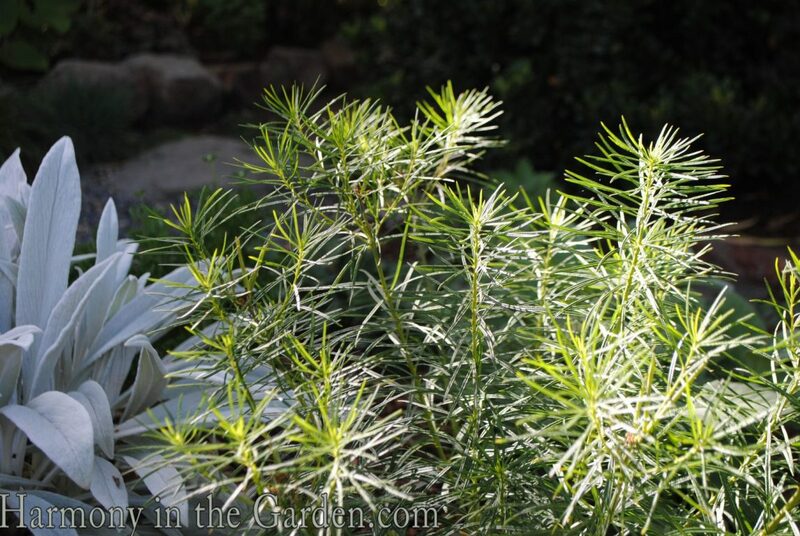 Favorite low-water plan is probably gaura, which is sad, because I have none at the moment! Would love your book, am just starting to upgrade my understanding of my garden. I enjoy your blog and look forward to listening to your talk at the Sunset Celebration. 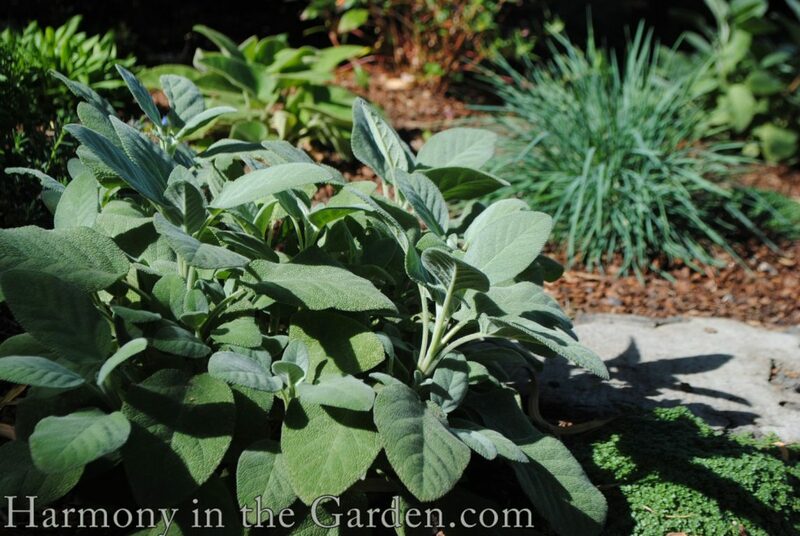 One of my favorite drought tolerant plants is Salvia dorrii. I use it as a cut flower in bouquets for my friends. One such friend calls the next day to express the wonderful scent of this plant. Lovely post and garden, Rebecca! My favorite plant in my hot, dry garden is Desert Museum Palo Verde (Parkinsonia ‘Desert Museum’), closely followed by Purple Splendor Desert Willow (Chilopsis linearis ‘Purple Splendor’. They are the focal points in my lawnless front and rear gardens, respectively. Sedums are my favorite low water plants. Your book has been on my list to purchase since it first came out. Your garden looks absolutely lovely. I adore the colors and form. I’m not familiar with Carex Everillo, but I’ll definitely be on the lookout for it. I planted 3 Ceanothus Carmel Creeper a few months ago and am really liking what they add to my garden. 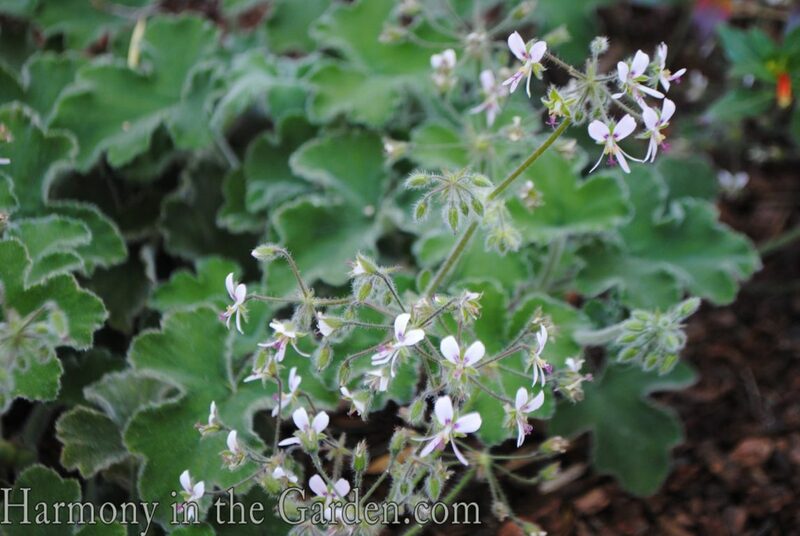 At the moment that’s my favorite drought tolerant plant, but by tomorrow it may be different! My favorite low water plant is any kind of orchid. Such beautiful photos. Thx for sharing!! I’m working on reducing my lawn and creating a pollinator garden. It’s so hard to get rid of it though . . . lots of shovel work! Does the cardboard or plastic method really work? After a year, can I just rototill it in or is there more to be done before it becomes a space for a garden? Thanks. Beautiful as usual! Reading your book and trying to come up with a new design to get rid of our front lawn. Thanks for all the help and encourage and education you provide to your readers! 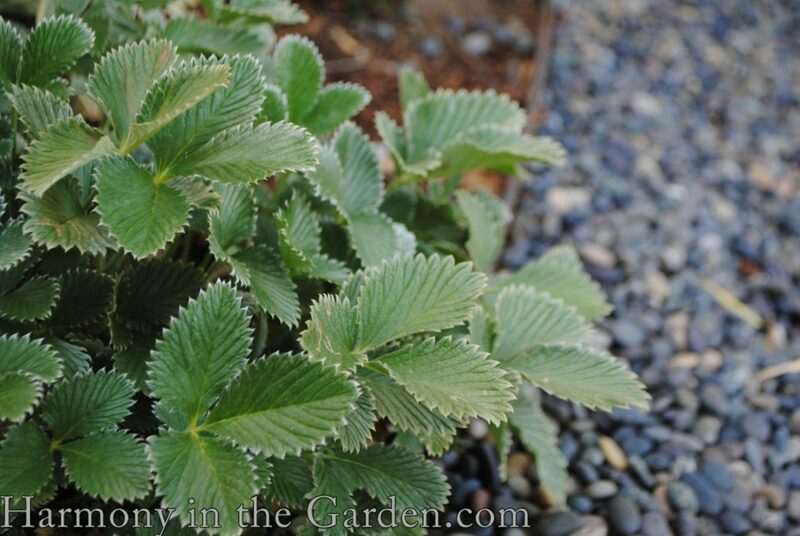 I’ll never look at plants, color and texture the same way since reading your book! Just one favorite? 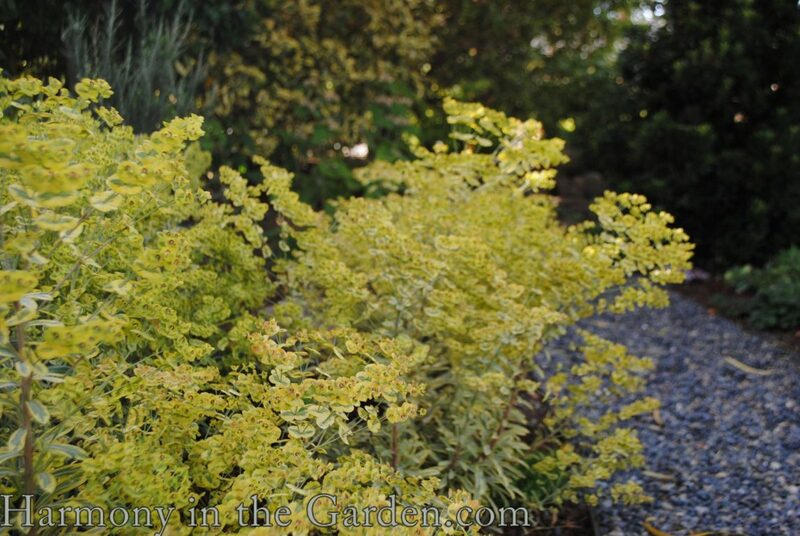 Going with the non grey thyme; mahonia ‘Soft Caress’, carex ‘Everillo’, and nandina ‘Lemon Lime’. Sorry, couldn’t pare it down any more. I garden in Georgia in Zone 8. I have a spreading Sedum (unknown cultivar) I planted in my Mother’s garden a long time ago which decided to start itself on the roof of the carport. It still grows there. My Mother died a few years ago, and I now live in her house. Two seasons ago I planted this Sedum in 3 of her old concrete containers. They are quite beautiful, but hate for me to water them. So I never do. They only are watered by natural rainfall unless we really have a drought period that lasts for weeks. I love rosemary, thyme, lavender, and sage. Thanks for this opportunity! 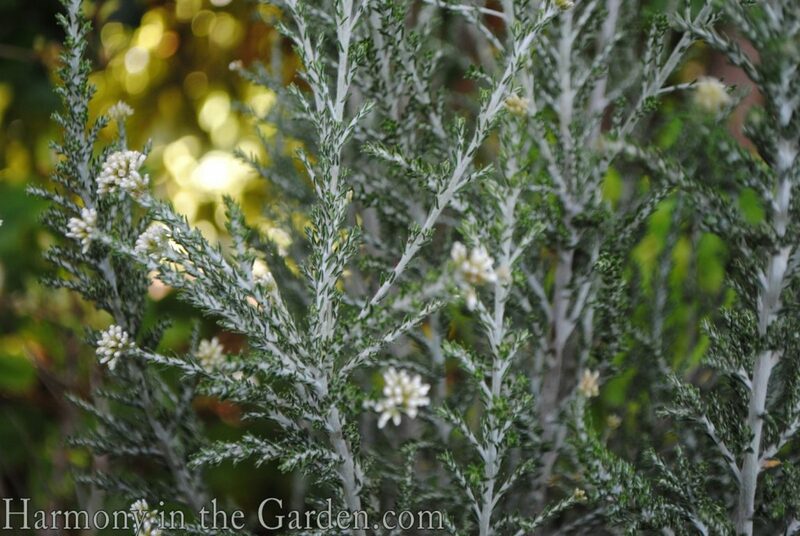 I love the scent of rosemary in the garden. While it doesn’t overwinter here in Wisconsin, I’m envious seeing it used extensively in landscapes when we visit Califfornia. Love reading your delightful blog and reading your new book! 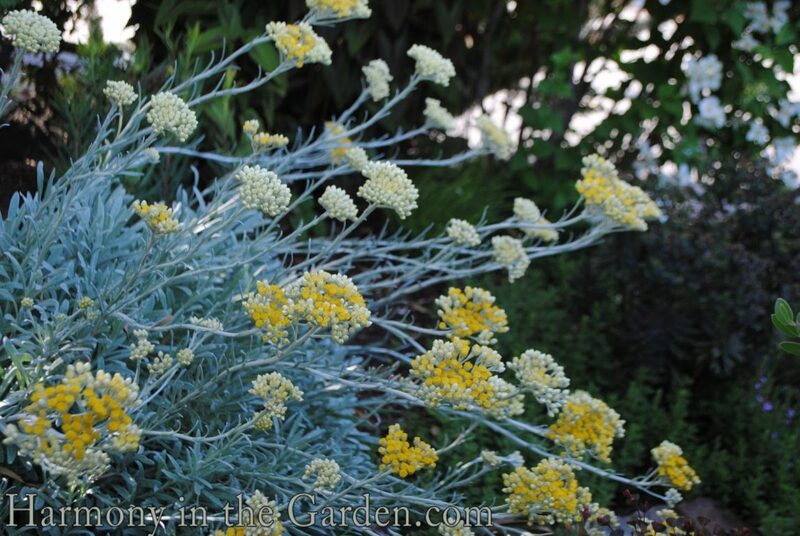 Russian Sage is a favorite of mine for a low water need plant. I live in zone 8 in Texas so it would be a tie between bush germander and “hot and spicy” oregano. 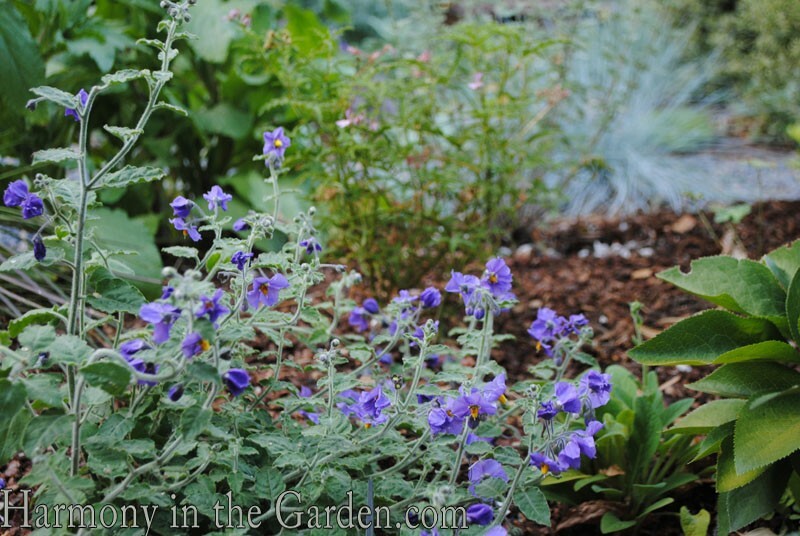 Bush germander forms low evergreen edging for beds and is a good tuck-in plant for a barren spot. “Hot and spicy” oregano stays lower than other oreganos and crates a nice mat aound the knees of other plants. Sadly, since neither plant has significant flowers, so they don’t the love they should from the gardening world. I already have your book, so don’t enter me in the drawing. I’ve been wondering lately if you would do a final post about how this garden turned out. I love it! I remember when reading your book, how the whole idea of color and texture echoes just struck me as brilliant. 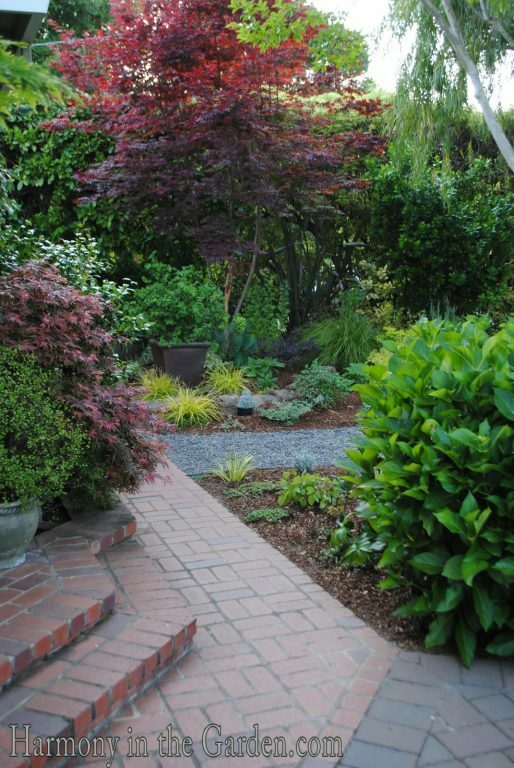 Great plant selections, I love maroon and chartreuse as well, and it is great to see how you apply the principles in your garden. I can’t wait until I get hired to remove a lawn, that would be one fun job.